The Unipiper, Portland’s favourite bagpipe playing unicyclist, apparently had a moment in the sun last month on American TV. 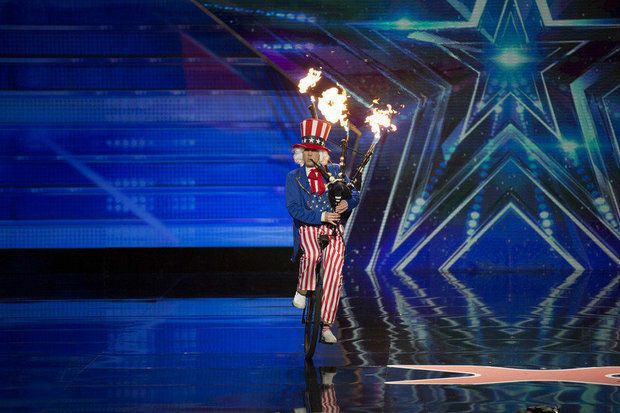 The piper featured on the massively popular America’s Got Talent, auditioning in front of judges including shock jock DJ Howard Stern, model Heidi Klum and Howie Mandel (I’m not sure who that is.) No idea how he did, although if this picture is any reflection he at the very least looked awesome, dressed as Uncle Sam this time. Obviously he left the Darth Vader mask at home but hopefully he’ll get the chance to perform the Star Wars theme on national TV again, possibly by the time The Force Awakens is released! I can’t find the video online but I imagine it’s awesome, hopefully this guy keeps getting exposure, maybe one day we’ll be able to book him as a piper for our wedding. Maybe a Scottish wedding piper will steal his gimmick! Who knows!? You can like the Unipiper on Facebook here. If you haven’t watched his videos already then you’re missing out and we recommend them wholeheartedly!